Already the teaching of Tlön’s harmonious history (filled with moving episodes) has obliterated the history that governed my own childhood; already a fictitious past has supplanted in men’s memories that other past, of which we now know nothing certain—not even that it is false. HUS IT WAS that, late in the afternoon of the Friday following my receipt of Cyn’s note, Albertine and I found ourselves seated side by side aboard a Long Island Rail Road train bound for Babbington, where, for me, it had all begun. Albertine was with me because she and I are together whenever it is possible for us to be together. We discovered long ago that the point of our lives is to be together, so we try to avoid all individual experience, within the limits of practicality and gracious living. This practice has brought us as close as any two people can be, I think. It also allows her to keep an eye on me. “I have no idea what the ‘Historic Downtown Plaza’ might be,” said Albertine, who knows the town as well as I do. The delightful town of Babbington is the Central South Shore’s nostalgia center—or, if not precisely its center, not far off the mark. Babbington offers fine accommodations, restaurants, its own historic charm, and many fascinating attractions and diversions. The Historic Downtown Plaza, a pedestrian mall lined with buildings dating from the 1950s and even earlier, serves as one of the major “destinations” for Babbingtonians and “out-of-towners” alike. Downtown employees and shoppers frequent the Plaza to have lunch or stroll through the variety of shops, to slip out of the drudgery of everyday life in the early twenty-first century and back into the blissful middle of the twentieth. The beautifully landscaped Plaza provides a setting for town festivals such as the Clam Fest, traditionally held on the first weekend of May. Highlight of the weeklong extravaganza is the crowning of Miss Clam Fest. Despite the controversy that has plagued the Fest for the last several years, it still draws an enthusiastic crowd. The clam-fritter-eating contest is always exciting and tense. Deaths have occurred. The Babbington Redefinition Authority is hard at work to make Babbington everything it might once have been. In Babbington you will find the perfect starting point for your passport to the past, the perfect place to start or end your day. “Oh, it’s just somebody’s attempt to squirt a little of the flavor of foreign travel onto a visit to Babbington,” I said. “Probably a fellow graduate of Babbington High,” I muttered, rescuing the poor pamphlet from her before she picked any other little nits of illiteracy from it. ALBERTINE AND I found the Historic Downtown Plaza easily enough. It was a T-shaped stretch of Upper Bolotomy Road and Main Street at the center of town. 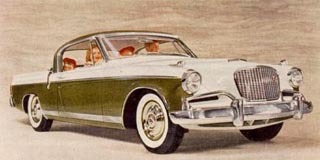 Two blocks of Upper Bolotomy and four blocks of Main (two to the east of the intersection and two to the west) had been closed to vehicular traffic, though there were cars parked at the curb. I admired some of these as I walked along, because they were handsome examples of the cars that had been the objects of my adolescent car-lust when I was in high school. “Wow,” I said in exactly the tone of awestruck reverence I would have used when I was too young to drive. “Watch where you’re going,” Al cautioned me, taking hold of my arm and steering me away from a collision with a vintage lamppost. “But not much of a back seat,” she said with a wink and a leer. With a sigh for days gone by, we went in search of the restaurant called Legends. The restaurant was just at the northern limit of the plaza in a space that had been filled by a large grocery store when Al and I were kids. The interior had been turned into a miniature shopping mall, with skylights overhead, giving it some of the feeling of a suburban shopping mall, but on a compact scale. Legends occupied the center, and the surrounding area was filled with shops, kiosks, and pushcarts stocked with souvenirs, gewgaws, and “antiques” from approximately the time when Albertine and I were spending Saturday nights in the back seat of her parents’ Lark sedan, parked among the concealing rushes at the edge of Bolotomy Bay. A small group had gathered at the circular bar for the incomparable happy hour. They all seemed to be regulars. They sat and drank. Now and then they spoke to one another. One of their number was addressed by the others as “Judge.” The free hors d’oeuvres on this evening were potato chips and a bowl of clam dip. A younger woman came in, apparently stopping by after work, climbed onto a barstool, crossed her eye-catching legs, and ordered a Tom Collins. “Shhh,” I said with a finger to my lips, and we settled into the poses we assume when indulging in silent eavesdropping. The happy-hour drinkers were talking of an approaching storm, Hurricane Felicity. Thousands had been evacuated from the New Jersey Shore, one of them noted. Tens of thousands more were without power in that area, according to another. Weekend plans were off, announced the woman with the Tom Collins. Taking Off is a work of fiction. The characters, incidents, dialogues, settings, and businesses portrayed in it are products of the author’s imagination and are not to be construed as real. Any resemblance to actual events or persons, living or dead, is entirely coincidental. 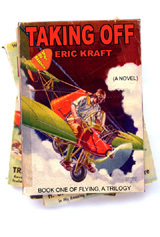 St. Martin’s Press will publish Taking Off in the summer of 2006. For information about publication rights outside the U. S. A., audio rights, serial rights, screen rights, and so on, e-mail Kraft’s indefatigable agent, Alec “Nick” Rafter.